Official advisers to the UK government have demanded Britain slash greenhouse gases by a fifth of current levels by 2020 - the toughest target so far. 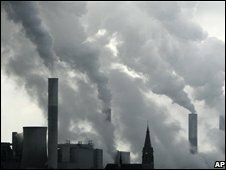 The Committee on Climate Change said a cut of 21% on 2005 levels was needed for the UK to play its fair share in combating dangerous change. It proposes firm carbon budgets for the next three five-year periods. It is believed to be the first time any major nation has attempted such a move. Ministers are considering the report. If the budgets work, they could be copied worldwide. The independent committee recommends that by 2020 it should be made almost impossible to burn coal for electricity without technology to capture and store the carbon emissions. This has major implications for the UK's energy policy. The report says fuel will inevitably become more expensive to achieve the carbon targets. But it says the government will need to compensate poor households rather than trying to keep prices down. To make the targets even harder for the government, the committee recommends the UK should not be able to buy its way out of its obligations by paying poor countries to cut carbon on our behalf. Until now, the government has been planning to buy up to half of our carbon credits. The report has been generally welcomed by environmentalists, but they are angry that the committee has not set any specific targets for aviation - the fastest-growing source of emissions. The committee has put aviation into the overall carbon budget but exempted it from specific targets until disputes over responsibility for international aviation emissions have been resolved. Greenpeace said the advice on coal-fired power stations meant the end of plans to build new plant at Kingsnorth in Kent. "Assuming the government accepts the advice of its own climate change committee, Kingsnorth is dead in the water," said John Sauven, executive director of Greenpeace UK. "Eon's investors and the company's executives will read the Turner report with sweaty palms, as their coal plans don't even come close to satisfying the new standards the committee is demanding." Lord Turner, the committee chairman, said the cuts could be achieved without compromising our lifestyles or economy: "The reductions can be achieved at very low cost (an estimated 1% loss of GDP growth in 2020). The cost of not achieving the reductions at a national and global level will be far greater." The climate change secretary Ed Miliband said: "We will give the report in-depth consideration but I am pleased to say that from 2009 carbon budgets will take their place alongside the financial budget." A ministerial source told BBC News that the government would almost inevitably adopt the committee's suggested carbon budgets. The big question will be how far ministers accept the committee's policies to achieve those reductions. The committee notes that the government has been good at making bold statements on climate but bad at putting firm policies in place.